Transfer to Busan Airport for a flight to Jeju Island- Car and driver only (No guide). Upon arrival, your Jeju tour begins. Note: Jeju SIC Tour is not available on Sundays. A Supplement will be charged for a Private tour. 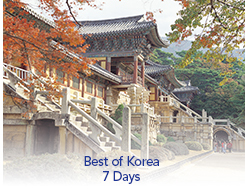 Continue your sightseeing tour of Jeju. Note: Jeju SIC Tour is not available on Sunday. Supplement will be charged for Private tour. After breakfast, transfer to Jeju Airport for a flight to Seoul - Car and driver only (No guide).